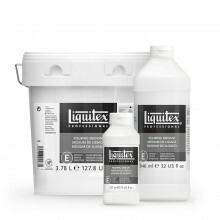 * A very clear size and ground that keeps your working surface visible. * Excellent ground for acrylic and oil paint. * Mix with acrylic color to have a tinted ground. * Dries clear to translucent depending on thickness. * Flexible, non-cracking and non-yellowing when dry. * For canvas, paper, wood, or any clean, porous, non-oily surface. * Sizes and primes while maintaining the original appearance of the support. * Provides paper with good tooth for chalk and oil pastel techniques. * Mix with a very small amount of transparent or translucent acrylic color to tint the ground while maintaining transparency.